A staple in the Iberia series, the F7 features the traditional flamenco wood combination of a solid European spruce top paired with cypress back and sides. 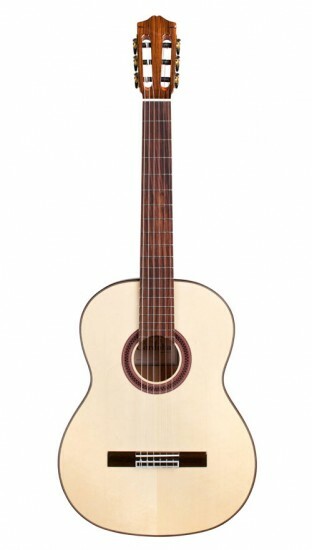 It is incredibly lightweight, built in the Spanish tradition with a slightly thinner body depth than a classical guitar. Featuring a flatter neck angle which allows for low action, and the bright, snappy tone characteristic of flamenco guitars, the F7 is the perfect guitar for both beginner and intermediate flamenco players. The built-in truss rod makes adjusting the neck angle on this guitar a breeze! It includes two clear golpeadores (tap plates on both the treble and bass sides).